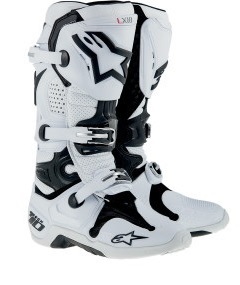 Alpinestars TECH 10 Boots, Free Freight! Alpinestars 2018 Tech 10 motocross boots are used by most of the elite in motocross/supercross because of the following Key Features: The one-piece co-injected foot chassis incorporates five different polymer compounds in a single lightweight piece to offer strength while maintaining flexibility and structural integrity. Innovative, lightweight upper combines full-grain leather with advanced microfiber together with an impact and abrasion-resistant TPU shell. Frontal protection features a dual closure system with an internal microfiber flap, plus Velcro brand hook-and-loop for a precise fit closure attached securely with a micro-adjustable, easy to operate, lightweight buckle. Shin incorporates a unique TPU blade system engineered to prevent frontal hyperextension and offer greater flex control. Innovative, ergonomic design for lateral and medial flex zones to provide superb front and rear flexion support which helps prevent damaging torsional forces around the ankle area. Medial-facing panel is constructed from a one-piece, specifically formulated polymer for improved structural stability and integrity, and incorporates a rubber insert panel for maximum grip contact and improved abrasion resistance. Contoured TPU calf protector plate offers impact resistance and incorporates the Alpinestars innovative rear blade system, formed with hard, shock-resistant and specifically developed red colored polymer compound to protect the heel and features a rear hyperextension guard. Soft microfiber gaiter helps seal out excessive water and dirt. Multi-density foot shell, incorporating heel and toe protection, is highly resistant to abrasion and impact, and adds to the boot's overall durability. Exclusive dual-compound sole is seamlessly integrated on to the multi-density foot base structure with built-in support. The sole offers superior durability, grip and feel while riding. The central sole insert is easily replaceable and Alpinestars offers a full sole replacement and boot repair service. New buckle closure system includes high-impact and uniquely developed red color aluminum bridge closures, with memory and a quick-release / locking system with self-aligning design for easy, precise closure and improved riding performance and security. All buckles are easily replaceable. Internal poly-fabric lining with 3D open cell foam incorporates anti-sliding suede on heel area to keep foot located inside the boot. The Tech 10 boot is CE certified. Note: Limited Edition. Inner Ankle Brace System: Alpinestars' innovative and patented biomechanical inner ankle brace features medial and lateral "C" torsion bars to control ankle and leg rotation, while allowing freedom of movement. Dual connection torsion bars offer the rider natural ankle movement with progressive damping of torsional forces during an accident. Replaceable wide fit torsion bar included. TPU protection and shock absorbing padding on the heel and ankles and an ultra-thin and flexible forefoot area provide increased sensitivity and control. Top of the Line from Alpinestars! Most motocross and supercross pro's wear the Tech 10 because it is simply the BEST!Avail in White,Black, White/black/floryellow and white/black in adult sizes 7-14. Please SELECT Free Shipping in the mainland US.